The leader of the Palestinian Authority, Mahmoud Abbas, has told Tony Blair he is going to press ahead with early elections. Mr Blair, who is in the West Bank, praised the decision, which has provoked clashes between Mr Abbas' Fatah group and its rival, Hamas. Fighting between the two has paralysed the administration. 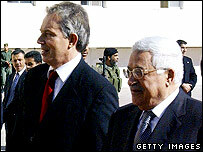 Mr Blair also told the Palestinian leader he backed his efforts to revive the peace process. "Nobody should have a veto on progress," Mr Blair said. Mr Abbas' call for early elections to resolve tensions between the rival factions has been labelled a "coup" by Hamas, which won a sweeping victory in parliamentary elections in January and controls the government. But the Palestinians have faced an international aid boycott since because of the group's refusal to renounce violence or recognise Israel. Mr Abbas said he had called for early presidential and legislative elections to relieve "the current impasse". There have also been a series of clashes between the two groups in recent days. On Sunday, a ceasefire was reported, but outbreaks of violence continued through the night and into Monday. "I felt it was essential to allow the people to have their say on a platform that achieves Palestinian national interests," Mr Abbas said. He urged Mr Blair to lift an aid freeze on the Palestinians and said he was ready to hold "serious" talks with Israeli PM Ehud Olmert. Mr Blair praised Mr Abbas and urged the international community to back a new push towards peace in the region. "Your people are suffering," Mr Blair told Abbas. "We don't want anything to stand in the way of helping the Palestinian people." Mr Blair is due to meet Mr Olmert later on Monday. Lord Levy, Mr Blair's special envoy to the Middle East, has joined the prime minister on this latest leg of the tour and is thought to have held preparatory talks with Israeli officials.